The Maroon and Gold led for most of the contest, but the Bishop’s Gaiters would not go away. Concordia couldn’t withstand the reigning provincial champion Gaiters this past Saturday afternoon at the Concordia Gymnasium, as the visitors rallied for a 66-60 victory, their first of the season. “We lost a game we should have won,” said Stingers guard Jaleel Webb, a former Bishop’s Gaiter who scored 17 points in the loss. 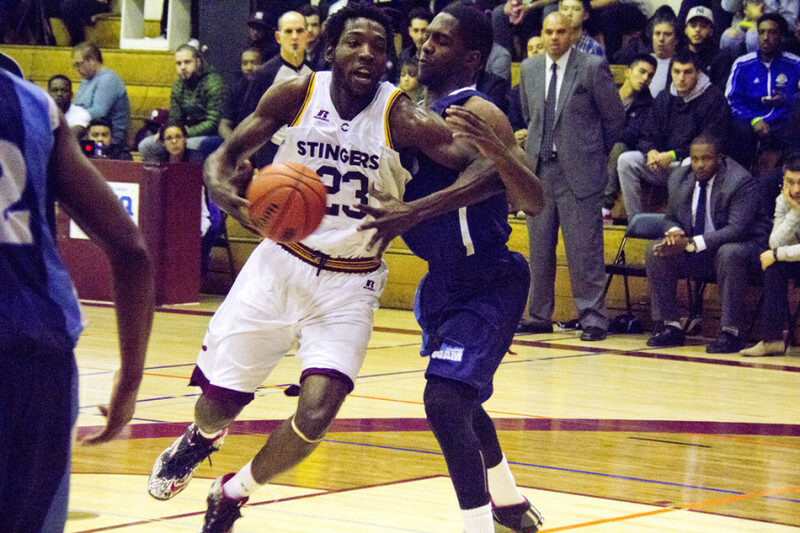 “Thought we had two good stretches of about eight minutes where we took a 10 and 13 point lead but we were just very inconsistent defensively,” said Stingers head coach Rastko Popovic. “Our defence just didn’t follow the game plan like we did early when we took the lead and some guys, just mentally, I don’t think were ready to play. “If you have a defensive plan and one guy doesn’t follow it, the other four [players] can do a hell of a job but if somebody doesn’t do it—it’s a team sport so you got to have five guys do it,” Popovic added. Bishop’s were led by Jonathan Bermillo, who scored 19 points in the win. 11 of his 19 points came in the fourth quarter and were instrumental in bringing the Gaiters back in the game. Last week, the Gaiters held a 20-point lead on the Laval Rouge et Or, only to lose 83-76. This week, Bishop’s, who have 12 first-year players and only three players from last year’s team, were down by as many as 16 points against Concordia. Only this time, Bishop’s came back for a victory. “At times it’s been frustrating dealing with a whole new batch of kids coming straight out of high school,” said Bermillo. “The majority of our league are a bunch of men. “We’re the team that has the most room to grow, so that’s on the plus side for us.” Bermillo added. The Stingers scored 25 points in the first quarter while only allowing 13, putting the Gaiters behind early. However, the Stingers offence couldn’t keep up, scoring only eight more points before half time. The Stingers carried a lead into the fourth quarter where Bermillo came alive for Bishop’s. The guard hit a jump shot to bring his team within three points of Concordia, before scoring a three-point shot, tying the game at 48 points with over nine minutes left in the quarter. Bermillo would hit two more three-pointers in the fourth, widening the lead for the Gaiters and putting the game out of reach. Concordia won’t play again until New Year’s Day at the Shoveller Men’s Basketball Tournament at Dalhousie in Halifax. The Stingers will play the Acadia Axemen. The Gaiters will play their next game on Jan. 7 against the UQAM Citadins.